Venue: Flushing Meadows, New York Dates: 27 August-9 September. Coverage: Live radio coverage on BBC Radio 5 live sports extra and text commentaries on the BBC Sport website. Williams, seeded 17th, trailed 4-2 in the first set but hit back to win 6-4 6-3 against the Czech eighth seed. The American, 36, is seeking her first Grand Slam trophy since giving birth to daughter Olympia last September. If she wins it would be her 24th major title - equalling Australian Margaret Court's all-time record. "I don't think I have another 10 years of having opportunities to be able to play and win championships," said former world number one Williams. "Every match really means a lot to me. I kind of go out there and I just do the best that I can." Williams faces Latvia's 19th seed Anastasija Sevastova, who knocked out American defending champion Sloane Stephens earlier on Tuesday, in the last four on Thursday. Six-time champion Williams has reached the semi-finals in her past nine appearances at Flushing Meadows, although missed the tournament in 2010 with a foot injury and last year because she was pregnant. Williams is only playing her eighth tournament since becoming a mother, but had only dropped one set - in her last-16 match against Estonia's Kaia Kanepi - on her way to the last eight. However, having lost to Angelique Kerber in the Wimbledon final, there were question marks how she would fare against another high-calibre player. After a slow start against the big-serving former number one, Williams grew into the match as she responded to some vociferous backing from Arthur Ashe Stadium. 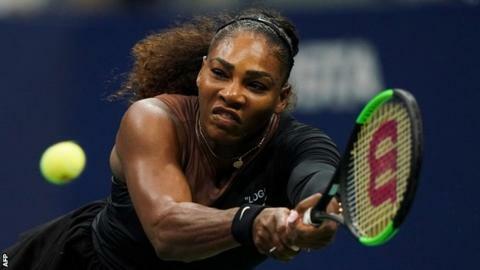 The six-time US Open champion won eight games in a row - four at the end of the first and four at the start of the second - to help her secure victory in one hour 26 minutes. It was her first win over a top-10 ranked player since beating Britain's Johanna Konta at the 2017 Australian Open. "I feel like I'm at a level where I can play and try to compete against these amazing women in the top 10," said Williams, who had lost her three previous matches against top-10 players. Williams suffered a chastening defeat by Pliskova, who had a brief spell as world number one last year, when they last met each other in the 2016 US Open semi-finals. And it looked like she could face more trouble when 26-year-old Pliskova threatened to go a double break up in the first set. The tall Czech was unable to convert break points for a 4-1 lead and then again for 5-2 - and that was the momentum-changing moment in what had promised to be an engrossing match. Williams upped her number of winners as Pliskova's unforced error count grew, a pattern which continued in the early part of the second set. Little danger seemed apparent for Williams when Pliskova clawed one break back for 4-1, only for the tension to grow when the world number eight moved 40-0 ahead on the American's serve in the seventh game. Williams responded with some huge serving to see off four break points, averting danger for a 5-2 lead and allowing her to wrap up victory in her next service game. "I played much better two years ago," Pliskova said. "I was able to hold the serve much better this time - but I think maybe Serena's back on the level where she was. "It doesn't matter that she's [seeded] number 17 or 18 now. I think she's still the strongest."